The World Trade Report 2012 examines why and how governments use non-tariff measures, including domestic regulation in services. Such measures can serve legitimate public policy goals, such as protecting the health of consumers, but they may also be used for protectionist purposes. The Report reveals how the expansion of global production chains and the growing importance of consumer concerns in richer countries affect the use of non-tariff measures. It also reports that such measures represent the main source of concerns for exporters. The focus of the Report is on technical barriers to trade (TBT) regarding standards for manufactured goods, sanitary and phytosanitary (SPS) measures concerning food safety and animal/plant health, and domestic regulation in services. While regulatory standards restrict trade in agricultural products, the Report finds, the existence of standards often has a positive effect on trade in manufactured products, especially in high-technology sectors. Moreover, the harmonization and mutual recognition of standards is likely to increase trade. The Report identifies several challenges for international cooperation, and the WTO more specifically. First, the transparency of non-tariff measures needs to be improved. The newly created WTO database I-TIP (Integrated Trade Intelligence Portal) will help in improving transparency. Secondly, more effective criteria are needed to identify why a measure is used. Thirdly, the increase in global production chains calls for deeper integration and regulatory convergence. Lastly, capacity-building is a vital element in improving international cooperation. Non-tariff measures, such as TBT/SPS measures, are often the first-best instruments to achieve public policy objectives, including correcting market failures arising from information asymmetries or imperfect competition, and pursuing non-economic objectives, such as the protection of public health. While many NTMs are concerned with consumer protection, NTMs can also be utilized by political incumbents to protect domestic producers. Economic, social and technological advances have resulted in higher consumer demand for food safety and posed new challenges in managing globally fragmented supply chains. Food safety measures have proliferated as a tool to respond to these challenges. As a consequence, various approaches to mitigate possible negative trade impacts, such as harmonization of standards, equivalence and commitment to a set of rules, are receiving widespread attention. Transparency is a major issue with regard to both NTMs and services measures. The relative scarcity of information on non-tariff measures is partly due to the nature of these measures, which are inherently more difficult to measure than tariffs. The WTO and other international organizations have undertaken substantial efforts and made good progress in classifying and collecting data on NTMs in recent years, and these efforts are starting to extend to services measures. However, more needs to be done to obtain a clearer and more complete picture of the trade policy landscape. Not all NTMs have a negative impact on trade. Public policy measures such as TBT/SPS measures and domestic regulation in services, in particular, do not unambiguously increase or decrease trade. TBT/SPS measures and domestic regulation in services affect not only how much two countries trade but also the number of countries with whom they trade. There is also some evidence that conformity assessment is particularly burdensome. Negative effects on trade are mitigated by a reduction in policy divergence, whether through convergence to international standards, harmonization or mutual recognition. If harmonization and mutual recognition of standards occur at the regional level, there may be significant trade-diverting effects on outsiders and regulatory “lock-in”. This appears to be the case especially for developing countries. Traditional trade agreements contain provisions that focus on addressing the problem of tariffs being replaced by non-tariff measures. The changing nature of international trade and the use of private standards may prompt the need for deeper forms of institutional integration. Moreover, the growing number of reasons why governments resort to NTMs, including for health, safety and environmental considerations, creates a need to develop rules to facilitate co-operation in the identification of efficient and legitimate uses of NTMs. The SPS and TBT agreements are “post-discriminatory” agreements. Although they include non-discrimination obligations, they also contain provisions that go beyond a “shallow integration” approach. They promote harmonization through the use of international standards and include obligations that are additional to the non-discrimination obligation. This includes, for instance, the need to ensure that requirements are not unnecessarily trade restrictive. Some question the appropriateness of these “post-discriminatory” obligations, arguing that the assessment of a measure’s consistency with such requirements is difficult without WTO adjudicators “second-guessing” a member’s domestic regulatory choices. Challenges to international co-operation on NTMs. First, the transparency of NTMs must be improved and the WTO has a central role to play with its multiple transparency mechanisms. Secondly, more effective criteria are needed to identify why a measure is used. Better integration of economic and legal analysis may help achieve this goal. Thirdly, the increase in global production sharing poses additional challenges for the multilateral trading system, calling for deeper integration. A number of challenges are more specifically related to public policies. Addressing the adverse trade effects of TBT/SPS measures and domestic regulation in services requires regulatory convergence. Part of this convergence takes place at the regional level and part of it at the multilateral level, raising the question of the optimal level. The role of governments and of the WTO with regard to private standards also needs clarification. Negotiations on domestic regulation in services have turned out to be very difficult to conclude, mainly because of concerns with regulatory autonomy. Lastly, capacity building could make a more significant contribution to improving international cooperation on public policies. 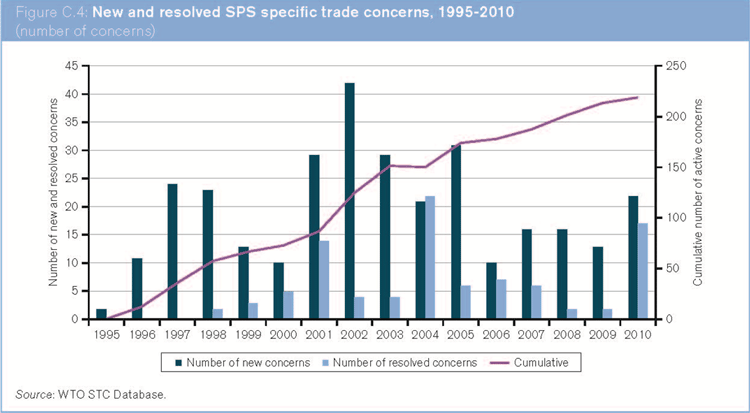 WTO data on notifications show an increasing use of TBT/SPS measures since the mid-1990s. This increase in the incidence of TBT/SPS measures is reflected in an increase in the number of specific trade concerns raised by WTO members in the TBT and SPS committees. Over the last five years, however, only 11 per cent of disputes cited the SPS Agreement and 12 per cent cited the TBT Agreement. Evidence from ITC business surveys suggests that TBT/SPS measures are the most burdensome for developing countries’ exporters. In 2010, almost half (48 per cent) of the NTMs perceived as burdensome by exporting firms were TBT/SPS measures. The figure is comparable for the EU. Ninety-four per cent of specific trade concerns regarding SPS measures, and 29 per cent of those regarding TBT, are related to agriculture. Evidence from WTO disputes also shows a greater number of citations of the SPS and TBT agreements in cases involving agricultural products than in other cases. ITC business surveys show that, for exporters, more than 70 per cent of burdensome NTMs also create a procedural obstacle.